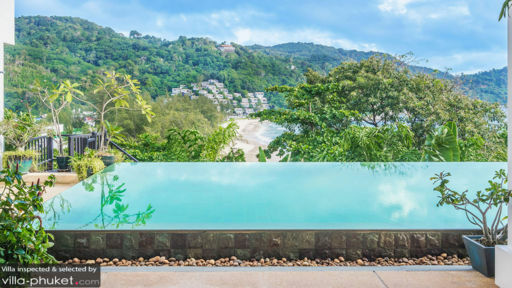 With a gorgeous location atop Kata Noi Hill, Villa Amanzi is surrounded by boundless water on all sides, overlooking Kata beach, which is only a few minutes from the premises. The six-bedroom luxury retreat, is the ideal vacation spot with mesmerizing scenes, rich tropical foliage, and infinity swimming pool. The location aside, the villa provides absolute comfort and luxury to its guests, including several additional services including in-house massages and spa therapies. 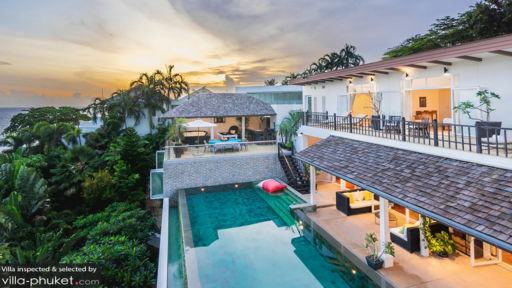 Great for large family gatherings or private parties with friends, Villa Amanzi is a quiet, serene spot for a holiday on the tropical island of Phuket. With two master suites, furnished with king-sized beds, and opening out to private balconies, Villa Amanzi is equipped to cater to all your needs. The super comfortable and inviting ambiance of the rooms, the villa will ensure that you are provided with everything. The bedrooms have en-suite bathrooms with wooden flooring and freestanding bathtubs. The third bedroom is also furnished with a king-sized bed and has an en-suite bathroom. The most striking feature about this room is the massage area complete with a bed, where you can indulge in an in-house massage arranged especially for you. The other three bedrooms are also all furnished with king-sized beds, and lead to private balconies or terrace that have direct access to the pool. Each of these bedrooms boasts of a fully-equipped en-suite bathroom. 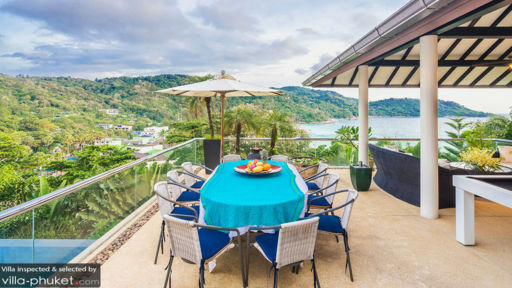 In order for you to get the best out of the spectacular views of Kata beach, the villa is equipped with several outdoor sitting areas, where you can relish a cup of tea, some drinks while taking in the beautiful vista. The infinity-edge swimming pool sits comfortably overlooking the dense natural vegetation, and beyond the sparkling waters of the sea. Relax in the pool, splash around rejuvenate your sense, and enjoy the blissful tranquillity of the area, as there are absolutely no disturbances that would bring you out of your reverie. Up the welded staircase, you will reach an outdoor lounge deck, which is furnished with black rattan furniture, including sofas, armchairs, tables, etc. This would be the most fun spot for breakfast, as you can see far and wide, all that Phuket has to offer. The contemporary aesthetics of the living area add an opulent and comfortable vibe to the space with flattened staircases leading to mezzanine floors, loungers placed around the room, arched ceilings, and designer lighting. The living area is spread across two storeys, each of them offering lavish sitting areas furnished with comfortable couches, sofas, and armchairs. Both levels open out to either the swimming pool or a private veranda with the remarkable panorama extending before you. Apart from an outdoor kitchen and dining area, for an alfresco dining experience, there is an expansive kitchen on the upper floor, completely western. It is furnished and fully-equipped with all sorts of amenities and appliances for you use. The dining table is located on the main floor, and is fit for 10 people. Villa Amanzi also features an open bar, where you can grab a few house specials. A house chef who will delight you with mouthwatering delicacies, both local and international, is the perfect touch to your stay. Start your day with a bang, digging into a scrumptious meal prepared for you. Indulge in a Thai massage and spa treatment, and the staff can even arrange for transportation around Kata beach and Phuket. As the villa is a beachfront property, you have easy access to Kata beach, which you can see directly from Kata Noi Hill. Head on down to participate in some water activities, or sun bathe on the sandy shores. Phuket has a lot to offer in terms of other smaller islands that you can visit, there are beach clubs like the one at Re Ka Ta, or seafood restaurants like Kata Rocks! Villa Amanzi is a nice property facing the sea. The team is helpful to make arrangements for massage, transport and other information we needed during our staff. I would like to special thanks the team at villa-phuket.com. Your team is efficient and helpful to answer all our enquiries before our trip. We just returned from a 10 days stay at Villa Amanzi or Villa Amazing as we call it. This was the third stay in 2½ years and it starts to feel like home when we visit. The staff are very attending, food delicious, house very spacious even in a big group. The pool and view does not get much better. We will definitely come back. For the first time, we witnessed a place that looks even more beautiful and amazing compared to the pictures. The manager and staff onboard were very helpful. Yummy good and a very clean place despite it being huge. Our stay there was very comfortable, convenient and satisfying. A wonderful Villa, brilliant and helpful staff and some wonderful Food! Shops and amenities within walking distance and Kata Noi Beach just 5 minutes walk away. We rented the villa for my husbands 60th Birthday, we where a group of 11 pax and had a party for 25 people on the day of his birthday, the villa staff where helpful with the arrangements , choosing the menu, helping with the serving of our guests, it certainly is a birthday he will remember. Thank you, it's been a fantastic week in the villa almost as being home. Fantastic staff. We did enjoy your kitchen for our dinner parties. We will come again. Service - Prim & team were extremely attentive and helpful with every need we required. For our Xmas dinner, they even brought us to the fish market and supermarket for shopping as part of our experience. The villa is lovely. The photos didn't do justice to the place. We thought the actually villa looks a lot better and exciting. 'The view of the sunset and beach is breath-taking. However, the design of the staircase and there is no glass panel from level 1 underneath the staircase. Perfect location. Away from the noise and secluded into its own heaven, it is the perfect location for anyone visiting Phuket who wants to be close to nature and the luxury of a pampered holiday. Love love love the pool. Love Kata Nio Beach. Beautiful beyond words. The staircase was my major stress with my 16 months loving to climb up and down the floors all the time. Sofia and her staff took care of all the details for our group making this holiday easy and relaxing. Thailand is good, the house is great, and the staff is perfect! Kata is such a lovely part of Phuket. This home was a luxurious delight but what made the difference between an OK holiday and the great holiday we experienced was the lovely staff you have here! Villa amanzi had one of the best views I have ever seen. Being able to look over both the town and the beach was truly an experience I won't forget any time soon. The villa itself was clean and comfortable and it came to feel like another home soon after we arrived. The staff was courteous and professional, and i felt fully accommodated the whole time I was there.